The Story Behind "Over the River and Through the Wood"
“Over the River and Through the Wood” was originally published in 1844 as a poem written by Lydia Maria Child. The poem was published in Child’s book of poems Flowers for Children, Volume 2, and was originally titled “The New-England Boy’s Song about Thanksgiving Day.” In time, Child’s poem was set to music by an unknown composer, and over the years many children have grown up singing the song in school or community holiday programs. “Ring in the Holidays” with the Bells on Temple Square! The Bells on Temple Square celebrate the beginning of this year’s holiday season with “Ring in the Holidays,” their semiannual concert, on Friday and Saturday, November 16–17, 2018, at 7:30 p.m. mountain standard time in the Salt Lake Tabernacle on Temple Square. The concert will also be streamed live at www.thetabernaclechoir.org on both November 17 and 18, at 7:30 p.m.
Tickets are free but required for the concerts and will be distributed on a first-come, first-served basis beginning Tuesday, October 30, at 10:00 a.m. mountain daylight time online through lds.org/events or by calling 801-470-0080. Each patron may request four tickets, and admission is open to those eight years and older. The Tabernacle Choir at Temple Square is thrilled to announce acclaimed Tony® and Emmy® winning actress and singer Kristin Chenoweth as the featured guest for the 2018 Christmas with The Tabernacle Choir concerts! Concert tickets have all been distributed. Watch the Choir’s website for more details of future ticket give-away contest.The Christmas concerts will be presented on December 13, 14, and 15 (Thursday–Saturday) at 8 p.m. in the Conference Center in Salt Lake City. The Christmas concerts have become a traditional audience favorite and will include a 600-person cast of 360 Choir voices, nearly 100 members of the Orchestra at Temple Square, the 32-member Bells on Temple Square, and about 100 dancers who combine with the guest artist to present this annual spectacle. The Phantom of the Opera (Le Fantôme de l’Opéra), by French writer Gaston Leroux, was first published as a novel in 1910. It was based on the belief that the Palais Garnie opera house in Paris, France, was haunted by a ghost. Leroux was convinced that the Phantom was real and even includes research to prove the truth of the ghost in the prologue to his book—a claim which he upheld throughout his life, until his death in 1927. Because the performance took place outside the U.S. Capitol building in cold weather conditions, it was important to make sure the singers were comfortable. During the Opening Ceremony for the 2002 Olympic Winter Games in Salt Lake City, the Choir performed at an outdoor venue in coats provided by the Olympic Committee. After the Olympics, the attire was gifted to the Choir and stored for future use. The warm, cream-colored Olympic coats with matching turtlenecks were taken out of storage to be used again for this special occasion. The red-plaid scarves made by the ladies’ wardrobe committee accented the coats for this internationally broadcast event. Here is the complete collection of all ‪general conference images from October, 2018 in English, Spanish, and Portuguese. 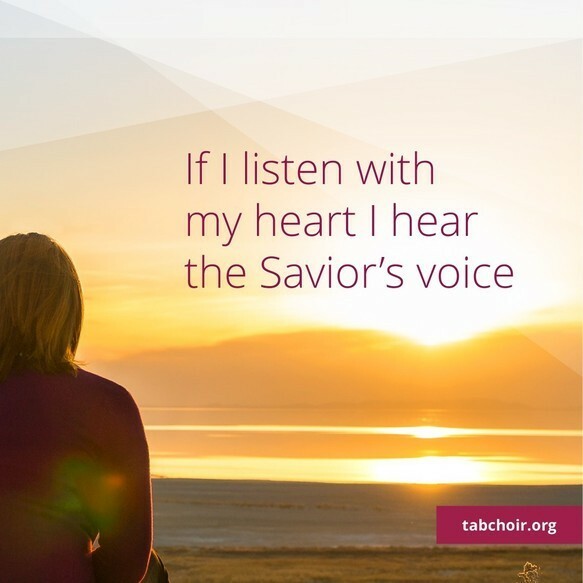 The collection includes sharable images for hymns such as "I Believe in Christ," "Come, Come, Ye Saints," "Rejoice the Lord is King," "If I Listen with My Heart," and a hymn written by Russell M. Nelson titled "Our Prayer to Thee." The Mormon Tabernacle Choir now has 16 videos with at least 1 million views! Since joining YouTube in 2012, the Choir’s channel has snowballed and reached the 80 million overall views mark. Keep watching, sharing, liking, loving, and singing and dancing along with our videos. Here’s to many more millions of views and many millions of hearts touched by the message of the music. Currently, there are over 1 billion YouTube users, 300 hours of video uploaded every minute, and 4,950,000,000 videos viewed every day. The average time users spend watching videos on YouTube is 40 minutes. YouTube is now the second largest search engine—second only to Google, which owns them. The Mormon Tabernacle Choir joined the YouTube world in 2012, and the channel has now crossed the 40 million-views mark. When the Choir launched its YouTube channel in 2012, the welcome from fans and fellow artists was overwhelming. Famous names such as The Piano Guys, Lindsey Stirling, Tom Brokaw, Katherine Jenkins, and even the President of The Church of Jesus Christ of Latter-day Saints, Thomas S. Monson, made welcome videos for the occasion. President Monson concluded his video by saying, “The incredible music of the Mormon Tabernacle Choir is now at your fingertips.” Indeed, it is—there are currently close to 1,000 videos on the channel, including patriotic, Broadway, and film songs; behind the scenes videos; concerts; broadcasts; music videos; instrumental performances; holiday-themed videos; and many more.